I love a good gallery wall and, the truth is, everyone loves gallery walls. It’[s no surprise why—they do so many things all at once. They're an amazing way to add color and pattern into space. They give us art-lovers a way to display our entire collection on the same wall . They're an awesome way to take up empty space on a large wall and make the room feel fully inhabited. And most importantly they're one of the best opportunities we get to show who we are and what we love in our spaces. Gallery walls are just simply the best. But, if you're anything like me, you don’t want yours looking too conventional or like everyone else’s. Depending on your personal style—your gallery wall can be restricted to just pictures (photos or art). But, it can also be much more than just one medium. To make a great gallery wall, start with your favorite images like photographs, drawings, or art, and then start adding in the things you cherish like postcards from favorite vacations, your favorite records (I added one of my mom’s favorite band and another of my dad’s favorite), puzzles, taxidermy (faux obvi) or even pieces from your favorite game. The possibilities are essentially endless. 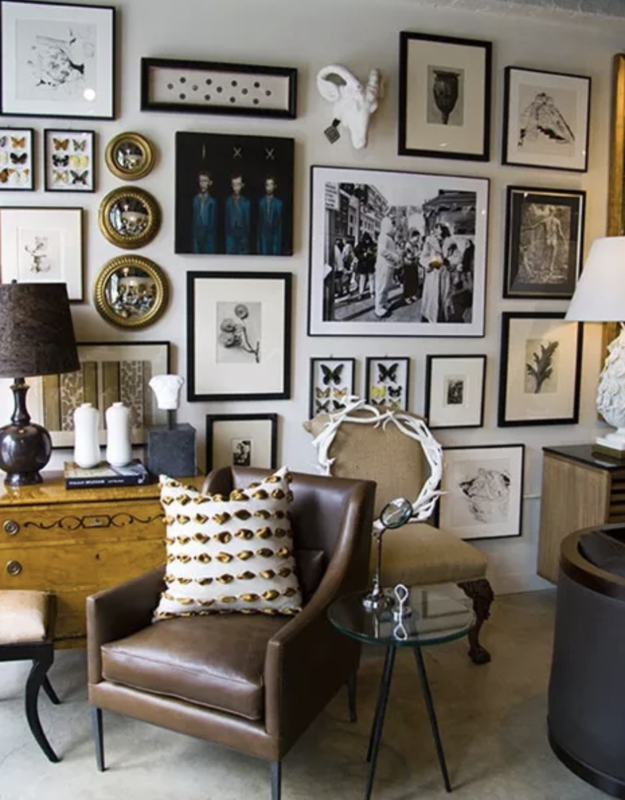 With a little bit of practice, attention to detail, dedication to your personal style and a keen editorial eye—your gallery wall will be totally chic and completely you in no time. I absolutely LOVE color (and if you’ve been following me for a bit now, you probably know this about me). Color plays a key role in pretty much every aspect of design. So, it’s no surprise that it’s gonna be a guiding light when putting together your gallery wall. Allow color—different shades and tones—to tie all your pieces together. A gallery wall that has a central concept is going to look more put together than one that doesn’t. You can still mix textures, materials, and objects to create a gallery wall that makes a really unique style statement. One of my gallery walls (hallway), I built it all around a floor length mirror. The other gallery wall, I used the same walnut frame with 18X24 abstract art from Minted in each corner to essentially frame the gallery wall. I love the not-so-put-together put together look, so by adding clean lines to the edges, I felt like I could get a little wild in the middle. The same way every piece on your gallery wall doesn't have to be an image, every part of your gallery wall doesn't have to actually be on your wall. If you place a gallery wall behind an entertainment center, self or mantle, you can use the surface as part of your display. This will allow you to play with levels in a way that creates dimension and adds depth. The mixed mediums create a great layered sense of texture on the wall, and we love that the gallery is floor-to-ceiling and incorporates the furniture so it flows seamlessly with the room. Last tip for a room like this? You'll want to pull out a level for this one. Making sure that every frame is perfectly straight is crucial to providing a sense of structure. Look closely at this wall? What do you see? Not a single one of these pieces is a painting or a photo. In fact, they are all serving platters. Who can turn down a great deal on a beautiful, unique serving dish, a ring bowl, or mismatched vintage china? We can’t! Unfortunately, unless you are entertaining very often, most of those beautiful pieces rarely see the light beyond the cupboards. But they can create a truly memorable gallery wall. We like that this gallery wall is in the bathroom for two reasons: First, the bathroom is often sorely neglected when it comes to design; and second, there’s not a lot of gregarious activity in the bathroom (think: impromptu kitchen dance party) that would make a gallery wall made of breakables especially vulnerable. But what we like most is that this is a truly creative use of unusual pieces in a space where you don't usually see gallery walls. When planning your next wall-based masterpiece, look for opportunities to think outside the box. You'll be amazed by what you come up with.